Distinctions: The male has a black bib, yellow breast, chin and face, dark cap with a bluish gray crown and an olive-green back. The female is somewhat similar without the dark bib or black cap. Both sexes have thin curved bills and show a large area of white in their undertails. Voice: Nasal or buzzy tone notes, similar to the Blue and Golden-winged Warblers. Nesting: Three to five white eggs. Suspended from a fork in branches of undergrowth or canebrakes. The nest is composed of fine grass, leaves and Spanish moss. 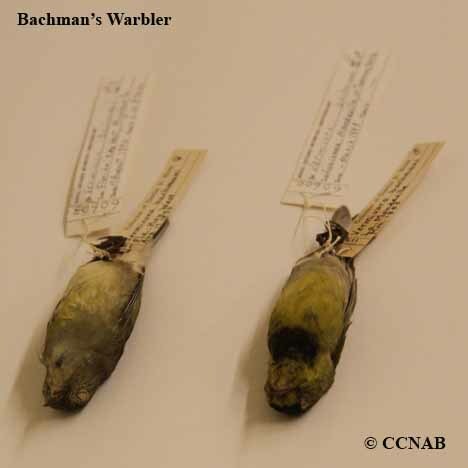 Images of a female and male Bachman's Warbler, courtesy of the Royal Ontario Museum, ROM, located in Toronto, Ontario, Canada. 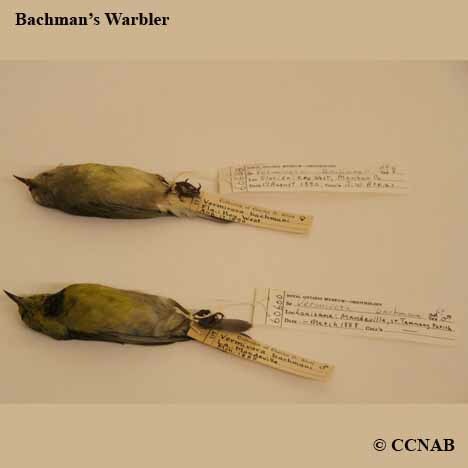 Distribution: The Bachman's Warbler was found in swamps and bottomlands of the southeastern states. It was never known to be an abundant bird. Unfortunately, these birds were shot and killed by collectors as they migrated through their known Florida corridors. Was seen in North Carolina, west to Missouri, south to Louisiana, east to Georgia. Migrated through Key West in the state of Florida to Cuba and the Isles of Pines during its migration periods.